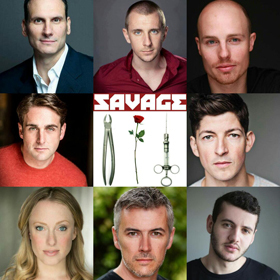 Claudio Macor's Savage is a brave play examining yet another facet of the depravity that was Hitler's regime, where along with other minorities in Nazi occupied Europe, homosexuals were rounded up and sent to the concentration camps. Savage however sets out to explore and expose the persecution of the continent's gays, focusing on the work of the real life Danish doctor Carl Vaernet, a Copenhagen GP who evoked an horrific hypothesis that by injecting monkey testosterone into the testicles of gay men, that they could be cured of their homosexuality. Macor weaves a fictional if troubling tale around his carefully researched argument. His gay protagonist Nikolai Bergsen is shattered by the experiments practised upon him, as elsewhere a vicious SS General is forced to hide his own homosexuality, as a kindly nurse and a coterie of companions facilitate the narrative. Interestingly, Macor reserves perhaps some of his sharpest criticism for the British war crimes investigators who after the war interrogated Vaernet with more than a degree of friendly bias - this being of course the era when homosexuality remained a crime in Britain and gays could be sentence to chemical castration. There are occasional moments of simplification in Macor's tale - perhaps understandable given its broad canvas that stretches to Argentina to where Vaernet, along with countless other Nazi criminals fled. But throughout, the story combined with a collection of excellent performances, make for compelling theatre. Alexander Huetson puts in a brave turn as Bergsen, showing us a terrified agony and anguish, alongside a complex, deep yet ultimately damaged love for Nic Kyle's Zack Travis. Macor takes an unconventional stance with the General - played convincingly by Bradley Clarkson. It makes for a reasonable argument to portray an evil man as himself troubled by his hidden sexuality - but *spoiler alert* is it right that the General's suicide should evoke our sympathy, just because he's gay and facing the same conventions of deceit and cover up that those who he is persecuting must endure? By all means recognise (and dare one say it, condemn even) the man's hypocrisy. But inviting us to care for his demise is perhaps a conceit too far. Gary Fannin's Vaernet is an intelligent if slightly caricatured portrayal, though ever since Gregory Peck played the notorious Dr Mengele in the 1978 movie The Boys From Brazil his evil Nazi doctor has been a tough act to top. Amongst the darkness though Macor injects a brilliant shaft of humanity in Nurse Paulsen, played with an enchanting sensitivity by Emily Lynne. Her care and compassion towards Bergsen reminding us of the importance of love and kindness in seeking to heal the ravages of hatred. Savage, itself inspired by the campaigning journalism of Peter Tatchell, confronts us with a glimpse of humanity at its darkest. Even more concerning is that this history of some 75 years ago is repeating itself today, in lands just beyond our own continent, where minorities are massacred for their belief or sexuality. Sadly, Macor's play makes for desperately essential theatre.